Sometimes, the basketball gods smile upon you. For Don Nelson, that moment came in Game 7 of the 1969 Finals, when he clinched the title for the Boston Celtics with one of the luckiest bounces to ever come off an NBA rim. For Russell Westbrook, it was that 18-foot, and-1 scoop shot from Game 5 of the Thunder’s second-round series with the Lakers this year. 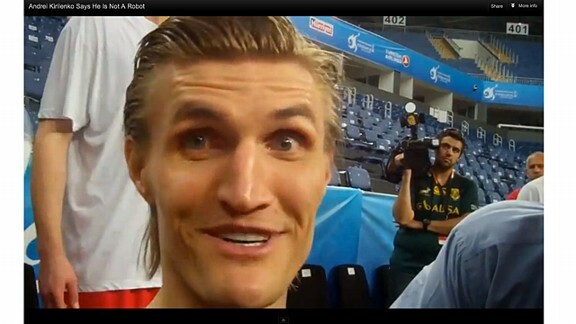 For me, it was stumbling into the craziest of Andrei Kirilenko crazy faces. That’s a perfectly reasonable quote and it was turned into a perfectly appropriate title for the video. But take it out of context and pair it with the still image of those deep-set, googly green eyes, and well, something completely different has been created. Andrei 3000 is born. Thank you, basketball gods.